To summarize this year’s healthcare happenings would be an exercise in futility. Instead, this wrap-up focuses on four topics that profoundly affected providers. An expected surge in the number of HIT professionals and generous federal funding make this an opportune time for HIM professionals to expand their knowledge base. Patient safety stands out as the main beneficiary of this technology that helps providers meet the “five rights” of medication administration. University of Utah medical researchers have made an important step toward diagnosing autism through MRI. Kaiser Permanente researchers have concluded that targeted age-specific computerized alerts can reduce the use of a specific blood test that may prove ineffective in older adults. Like a kick in the chin, coding for pain management can cause any upstanding coder to mumble in agony. 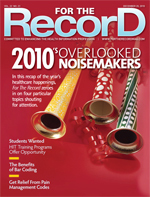 The online service EHRevent.org documents safety concerns related to EHR implementations. An industry expert offers insights into how Health Level Seven International standards work and how they differ from Web-based solutions. Exactly what is a continuity of care document? Where do the continuity of care record and clinical document architecture fit into the puzzle? Industry experts attempt to clarify. 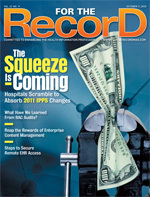 As it stands, behavioral healthcare facilities are on the outside looking in at meaningful use incentives. Nevertheless, that hasn’t deterred some from adopting HIT. The dawning of the new code set will influence how healthcare organizations shape their meaningful use strategy. Zevalin and Bexxar are FDA approved to treat follicular B-cell non-Hodgkin’s lymphoma. Learn how they’re being used in a clinical setting. The National Telecommuting Institute provides opportunities for the disabled to become work-at-home medical transcriptionists. Physician practices that install EHRs show better financial margins than those that have not, according to a report from the Medical Group Management Association. The National Institutes of Health has debuted a database featuring more than 2.5 million images and figures from biomedical literature. A diagnostic testing company has introduced a mobile platform that permits selected patients to view lab results. Healthcare organizations must set reasonable expectations if they are to have a lasting relationship with a transcription vendor. Physicians have shown an affinity for smartphones, but many healthcare organizations lack the ability to properly promote their use. As more healthcare organizations integrate EMR capabilities with revenue cycle management functions, HIM professionals need to adapt to slightly different roles. Improved techniques have increased cure rates, but it’s critical that providers recognize symptoms and recommend appropriate treatment. 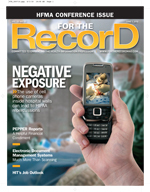 Industry experts discuss how the meaningful use rules will affect radiology departments. For physician practices reluctant to spend big bucks on an EMR, there exists a less-expensive alternative that could be a perfect fit. New York State has awarded nearly $9 million for a project that will leverage HIT to improve mental health care in the Hudson Valley. A new social network helps patients garner the emotional and financial support needed to speed recovery. New on the market is a Web-based chart abstracting solution that can produce electronic physician queries and tackle ICD-10 codes. 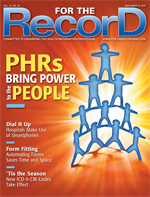 Evidence is mounting in favor of PHRs being a viable tool patients can utilize to monitor chronic conditions or maintain their wellness. If your healthcare facility is so form-filled that a trip to the DMV feels like a holiday, it may be time to look into some new technology. Apps are plentiful for healthcare organizations that want to keep patient information at physicians’ fingertips. Prompt treatment is key to preventing a serious problem from becoming a life-altering illness. Here’s a recap of the new quality best practices. Relax coders, this year’s ICD-9-CM changes are on the light side. 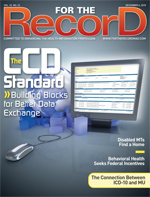 With ICD-10 looming, it appears federal officials took it easy on the rank and file. According to a recent survey, hospital executives are concerned that ongoing IT staff shortages could hamper EHR adoption projects. The Mayo Clinic has announced a network designed to help providers improve their use of social media platforms. Several major players in the transcription/speech recognition industry have reached agreements to collaborate on natural language processing projects. 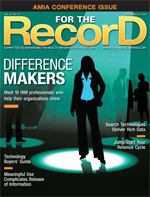 For The Record salutes 10 HIM professionals who are helping the industry transition into an exciting new era. As eligible providers prepare to meet meaningful use requirements, many experts view the provision to provide timely patient access to healthcare data as a notable hurdle. Healthcare organizations can enhance their clinical informatics through the use of enterprise search methods. Leading health experts discuss the merits of employing this controversial technique to counteract the condition’s effects. Learn how technology can ease the strain on chief financial officers looking to stay on top of revenue cycle management. A two-year initiative aims to help New York City's community health centers meet meaningful use and medical home standards for care. California physicians have filed a lawsuit against Blue Cross Blue Shield over the insurance company’s latest online doctor rating system. A new centralized tracking and workflow program allows healthcare organizations to manage all protected health information disclosures. On top of meeting meaningful use requirements, providers face a tough challenge from the updated inpatient prospective payment system guidelines. 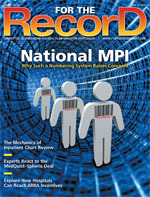 Enough data have been compiled to get a reading on possible trends in the Recovery Audit Contractor program. By offering forms development and enormous archiving ability, ECM provides solid support to EHR expansion. ABLAVAR is the first FDA-approved blood-pool MR agent that offers additional time for imaging and possibly some new applications. It takes sound planning and solid communication to protect against improper remote access to EHRs. Only 2% of U.S. hospitals in 2009 would have met federal meaningful use requirements, according to researchers from the Harvard School of Public Health. Learn how healthcare organizations can obtain physician buy-in when it comes to speech recognition. Consumers in the Sutter Health network can connect with doctors and hospitals through a free app. A group of 48 organizations led by the Markle Foundation has recommended the use of a “blue button” that would allow patients to download their health records. This approach leans heavily on HIT to make healthcare more accessible, more focused on outcomes, and more involved in engaging patients in their own care. Sloppy discharge summaries can create problems throughout a hospital, most notably in the realm of patient care. Industry experts discuss how best to handle consumer consent for health information exchanges. Two clinical studies report that vertebroplasty is no more effective than a sham procedure. What happens when research data and doctors’ clinical experiences collide? Project HealthDesign is working to demonstrate how to improve the health of people with chronic disease by helping them capture information about the patterns of their everyday lives. Results from a new study indicate that fewer than one third of the nation’s office-based physicians were e-prescribing and that even fewer doctors used important components such as checking for harmful drug interactions. IBM and Aetna subsidiary ActiveHealth Management have created a solution that provides clinical support for physicians and allows patients to access their own data. According to a Harris Interactive poll, the number of people who regularly go online to search for health information jumped by 10 percentage points over the past year. A rural nun/doctor uses technology to better serve her patients. 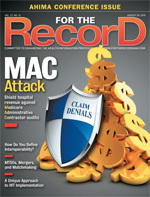 Healthcare organizations can inoculate themselves against MAC audits by implementing appropriate policies and taking valuable steps to improve their efficiency in responding and appealing. When it implemented Epic clinical systems, Hackensack University Medical Center opted to utilize in-house staff rather than hire additional employees or rely on consultants. Different people and different organizations have varying ideas of what constitutes interoperability among information systems. Meet two men who help broker the deals that keep the transcription industry in what seems like a constant state of flux. According to Spyglass Consulting Group, physicians dig using smartphones so much that the number employing the devices rose 60% over a four-year span. Verizon has unveiled a cloud-computing solution that facilitates the sharing of patient information among healthcare providers. A new website offers healthcare professionals a forum where they can share their experiences and ideas on how best to handle meaningful use requirements. 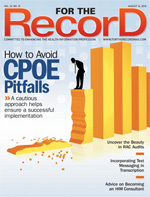 Implementation Learn the steps healthcare facilities can take to help ensure a successful relationship with computerized physician order entry. 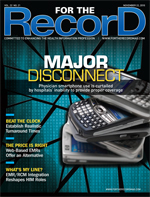 Industry experts weigh in on a new transcription solution that allows the secure exchange of digital records and medical images via text message. 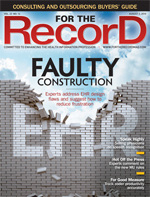 Coding experts explain how it’s possible for healthcare organizations to embrace the recovery audit contractor process. A doctor’s pioneering procedure gives new hope to countless expectant mothers whose pregnancies are complicated by twin-to-twin transfusion syndrome. For HIM professionals seeking a new twist on their careers, becoming consultants offers an opportunity to explore different avenues. Patients who communicated with their doctors via e-mail received better care and achieved better health outcomes, according to a Kaiser Permanente study. iRemoteScan for the iPad and iPhone allows individuals to remotely operate scanners connected to PCs and workstations. A new website has launched where medical practices can compare and choose EHR systems. Because EHRs lack a human-centric design, the technology often fails to win over physicians who decry its inability to fit into their workflow. No matter how advanced the technology, it will prove ineffective if hospital staff aren’t willing to give it a try. Find out what industry leaders think of the final meaningful use guidelines. Adult ADHD often goes unnoticed, but its effects are very real, leading to poor work performance and failed relationships. Learn the ins and outs about the companies ready to lend a hand to your facility. 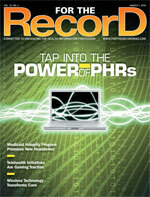 An HIT expert fills in readers on the new guidelines for EHR certification. Many factors can affect a coder’s productivity. Learn how departments can fairly and accurately measure their staff’s output. The HealthPartners Research Foundation will fund a study of whether EHR systems help reduce patients’ risk of developing heart disease. The AHIMA’s latest RAC guidebook helps HIM professionals manage the demands of an external audit. Implementing an electronic records system can be a lengthy and daunting project, but expertise from the HIM department can ease the burden. 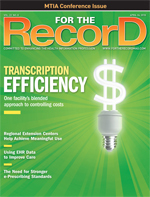 Speech recognition, the changing role of medical transcriptionists, and meaningful use are transforming how the industry approaches its future. Is it practical to create a national database that can confidentially report patient data errors and unsafe EHR conditions? Do they help tumor cells or normal cells thrive? Researchers are divided on the substances’ role in helping to curtail cancer’s deadly path. By adding electronic records technology to their practices, physicians change the dynamic of how they interact with patients. A 12-month pilot project aims to assess the impact of sharing physicians’ encounter notes with patients through online medical record portals. The Agency for Healthcare Research and Quality has released software that hospitals can use free of charge to compile, analyze, and post data on the quality and cost of their healthcare. 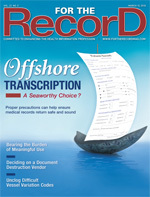 ExecuScribe and BayScribe have developed Web-based documentation software designed to improve the dictation process. A number of factors make it unlikely that a suitable system will be devised to tag each patient with a unique identifier recognizable in all healthcare settings. Under intense pressure to code accurately and quickly, coders need a little bit of detective in them to successfully navigate the history of a patient’s hospital stay. By conducting a thorough assessment of their IT operations, healthcare organizations can get a read on their chances of meeting meaningful use criteria and collecting federal incentive funds. Leading researchers discuss sleep apnea symptoms, treatment, and an eye-opening study involving elders. Industry leaders offer their thoughts on MedQuist’s acquisition of Spheris. HIT backers recently received more reason to boast when Kaiser Permanente found EMRs helped patients lower their heart disease risk. A recent national survey indicated that about one half of parents of children aged 17 and younger would like to be able to communicate online with their child’s physician’s office. A new book provides an overview of the social media tools healthcare organizations are using to connect with patients, colleagues, and others. Cell phone cameras add another variable to patient privacy concerns that must be addressed by healthcare organizations. PEPPER reports have returned with a new look, one that industry experts say can help providers spot payment errors. Many hospitals are starting to realize the need for a true electronic document management system in addition to a robust EMR. Fueled by celebrity media reports, bioidentical hormone replacement therapy has become one of the health topics du jour. 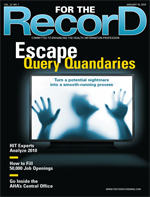 Federal funding for electronic record projects has created an unprecedented need for qualified HIT professionals. Arizona State researchers suggest that while EHR use may lead to lower mortality rates for certain conditions, the technology does not save hospitals money or reduce patient complications. Patients who have been the victim of an adverse medical event can share the details of their experiences by logging on to a new Web site. An enterprising Florida-based company has begun offering consulting services designed to help providers meet meaningful use criteria. Futuristic technology is transforming a children’s hospital’s pediatric ICU, but a recent study questions whether such projects are worth the expense. A platform launched by Verizon provides a way for medical transcriptionists to share digitized patient notes detailing care and treatment with doctors, hospitals, and other healthcare providers, but it’s not without its detractors. Make the effort to learn how to best teach staff, and chances are your EMR implementation will go that much smoother. Coding departments are sure to find the help they need from this extensive listing of leading vendors. To avoid complications, healthcare professionals can take these steps to ensure older patients have the best chance for a healthy recovery. Resident coding expert Judy Sturgeon, CCS, pens a letter to physicians that extols the virtues and value of DRG coders. 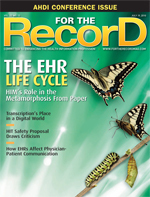 A survey conducted by the Center for Studying Health System Change discovered that EMRs could both help and hinder patient-doctor communication. The U.S. Department of Labor has laid the groundwork to create an online platform aimed at improving access to healthcare opportunities, including HIT-related jobs. An online simulator allows healthcare organizations to practice real-world scenarios in preparation for the transition to ICD-10. Recipients of federal HIT funds are making plans to take full advantage of the Obama administration’s generosity. HIM experts have raised serious concerns about meaningful use criteria that require hospitals to provide most patients with an electronic version of their records within 48 hours. By implementing a clinical documentation improvement program, healthcare organizations can support better patient care and increase their bottom line. Caused by the varicella-zoster virus, this infection of the nervous system requires prompt treatment if a patient is to avoid serious discomfort. 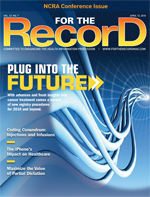 Are meaningful use incentive payments driving EMR adoption among small physician practices? A new survey has some telling answers. Employed correctly, a real-time location system can prove to be a valuable asset in terms of cost savings and patient care. Despite stiffened requirements, new research suggests health data remain at risk. Adults living with chronic disease are disproportionately offline in an online world. MedQuist and Artificial Medical Intelligence have inked a deal to collaborate on computer-assisted coding technology. What steps can HIM managers take when they receive the ultimatum to increase transcription operations? For the technology to become commonplace, industry experts say participating parties must receive stronger guidance from federal regulations. 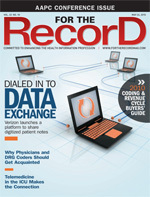 If nothing else, technology has enabled the healthcare industry to collect huge volumes of data. Now, creative organizations are starting to put it to good use. Imaging physicians at some facilities believe this exam provides superior images to a traditional stress test, particularly for women and patients who are overweight. 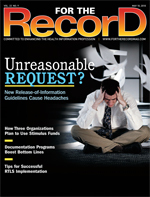 Regional extension centers hope to make life easier for providers pining for meaningful use. A Florida couple has been indicted for paying an ambulance company employee to steal patient information. Medsphere has introduced an online calculator to estimate the stimulus dollars a facility can expect and the date of a return on investment for implementing the company’s EHR. 3M has released software that enables physicians to dictate notes and view patient information on their mobile device using Wi-Fi or a 3G connection. Small in stature but standing tall with healthcare thinkers, the iPhone turns information exchange into a simple, straightforward process. Like some New Wave French films, these services will cause coders’ heads to spin. As science advances, cancer registry practices must follow suit, meaning providers and personnel face challenges to stay up-to-date. Healthcare professionals must take the proper steps to differentiate between a diagnosis of temporomandibular joint disorder and sinusitis. A survey by the Medical Group Management Association shows more than two thirds of practice administrators say meaningful use requirements would lower physician productivity. Learn how a Wisconsin-based health system took advantage of partial dictation to improve documentation. At the University of Pittsburgh Medical Center, patients are now able to view selected portions of their medical records online. HP and the College of Healthcare Information Management Executives have created a scholarship fund for future HIT leaders. Newer, more advanced technologies arriving on the scene are expected to make the documentation process easier, allowing physicians to maintain the efficient and timely workflow they desire. The complex nature of healthcare information is just one major hurdle that need to be cleared before efficient local, regional, and national exchanges can be established. 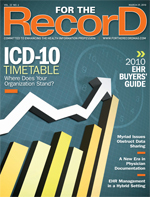 ICD-10 Timetable — Where Does Your Organization Stand? It may be three years in the distance and other federal initiatives may seem more urgent, but industry insiders say providers should be well into the assessment phase. The use of minimally invasive procedures has the medical community excited and curious about the direction of treatment possibilities. Here it is, the most “meaningful” guide in print. Despite the heavy buzz surrounding EHR adoption, many facilities still live in a hybrid world where HIM departments face unique challenges. 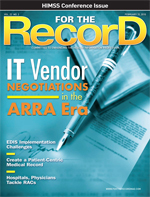 Smaller EMR vendors are hanging tough, reports Kalorama Information, whose recent findings show no single company owns the market. The Institute for Health Technology Transformation has announced a scholarship fund for educational programs taking place in 2010. When it comes time to select a document destruction vendor, healthcare organizations must consider several factors, including the influence of the HITECH Act. Several important factors must be considered to ensure medical records will be handled properly by overseas medical transcriptionists. Besides the possibility of implementing an electronic record system, healthcare organizations will have other issues to confront if they want to meet federal requirements. The H1N1 pandemic focuses attention on the implications of this influenza strain for older adults. Epocrates recently published results from a survey of its physician users that found about 20% of them plan to buy an iPad. A coding manager demystifies the rules surrounding vessel variations. Nine in 10 hospitals use social media to some degree, but most indicate it does little to attract new patients, according to a recent study. Graduates of the HIT program at the Borough of Manhattan Community College are now eligible to sit for the RHIT exam. The federal government’s latest project to collect overpayments differs greatly from the work being done by recovery audit contractors. This underutilized tool generates and stores information that can make the healthcare experience more valuable for both patients and providers. 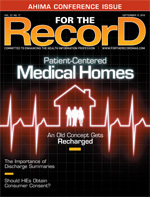 A pair of studies illustrates the power of at-home patient monitoring in terms of both care and cost savings. Trials experimenting with combinations of new and existing therapies are more promising than ever. The medical records department played a key role in a Wisconsin hospital’s bid for Stage 7 designation. Cisco Systems and Molina Healthcare are among the participants in a California project to provide health and wellness services to underserved communities throughout the state. GE Healthcare has introduced a number of tools that interface wireless technology with patient monitoring devices. The National Library of Medicine has launched a mobile version of its popular MedlinePlus site. HP hardware will soon be bundled with McKesson’s EHR and practice management software. By engaging in training sessions and maintaining the lines of communication, hospitals and their affiliated physicians can acquire the resources to combat RAC audits. The negotiating field has been revamped as healthcare executives and technology companies operate in a world where meaningful use takes precedence. A number of factors make successful implementation of an emergency department information system a challenge to many healthcare organizations. A couple of recent studies provide additional data on the possible dangers associated with gadolinium contrast and nephrogenic systemic fibrosis. The VA and Kaiser Permanente recently launched a pilot medical data exchange program that enables clinicians to obtain a more comprehensive view of patients’ health. Create a patient-centric record that is complete, timely, and accurate to stay a step ahead of the meaningful use criteria. Walgreens pharmacy patients now have the ability to securely download their prescription history to Microsoft’s HealthVault. To meet the demands of greater regulation, the AHDI and MTIA have released a manual to address best documentation practices. It takes more than a whip and a chair to make staff aware of how they can guarantee the hospital receives proper reimbursement for services. 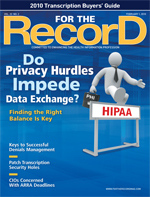 Some industry experts argue that too-strict privacy laws are hampering the electronic exchange of health information. Learn how medical transcription businesses can successfully tackle security risk analysis to bolster their defenses against impending HITECH regulations. Baby boomers are discovering that exercise can serve as “medicine” against the many types of ailments that become more prevalent as they age. Searching for state-of-the-art transcription companies that offer old-time service? You’ve come to the right spot. Although physicians support EHR use, concerns about potential privacy breaches remain an issue, according to two research articles. The Medical Transcription Service Consortium plans to develop a common framework for the exchange of health information among consortium members and their clients. New software enables physicians to use a single smartphone for voice communication, e-mail, Internet access, and dictation. For the first time, the VA is putting online raw data from its annual hospital report card. A CHIME survey measures chief financial officers’ concerns with obtaining stimulus dollars. Industry experts offer suggestions on how to best handle the process that benefits both physician and hospital—whether the doctor knows it or not. Top thinkers in the HIT profession field questions that provide an inside look at this year’s prospects. New grants are in place to help the HIM industry fund the arrival of 50,000 new workforce members. Should CT angiography and its significantly higher radiation dose be used instead of V/Q scintigraphy to diagnose pulmonary embolisms in young women? There is plenty of room for debate. A HIMSS survey questions healthcare organizations’ ability to meet HITECH requirements. Often overlooked but always appreciated, the American Hospital Association’s Central Office serves as a national sounding board for the coding profession. Three Denver-area providers have formed a health information exchange that impacts more than 1 million patients. Dell has introduced a mobile virtual computing offering that allows clinicians single sign-on and session-roaming capabilities on any device for applications they’re authorized to use within a facility. The Alzheimer’s Association is using Web-based technology to let caregivers track their loved ones’ travels.